Plunge pools are all the rage at the moment – and for good reasons! Generally speaking, a plunge pool is a smaller-sized cool pool that is typically used for dipping, wading, lounging, and cooling-off rather than swimming. Plunge pools are typically part of an activity, rather than being used for their own sake. What we mean by that is that using a plunge pool generally comes after, and is part of, some other activity – for instance to cool off after using the sauna or a strenuous workout. The medical science behind plunge pools is the fact that shocking the body by submerging in cold water after exposure to heat or heavy activity helps with recovery and boosts the immune system. So if you’re an avid sauna goer or a fitness buff, chances are you already encountered some type of plunge pool in its ‘natural’ habitat. Plunge pools are a great alternative for regular-sized swimming pools if you are short on space but still look for a way to cool off during sweltering summer days. Thanks to their smaller size, plunge pools also come at a lower cost than your regular backyard pool. The health and recovery benefits of dipping or wading in cold water do not apply only to avid exercisers and friends of sweating in the sauna – the idea of wading in cold water for health benefits has been around since the middle of the 19th century (see: Kneipp therapy), and has proven a good way of managing circulatory problems, and generally foster a more stable constitution. The refreshing and relaxing properties of submerging in cool water on a hot summer’s day can be found in a smaller plunge pool in equal measures as in their full-sized relatives. Since their purposes and requirements can differ vastly on a case to case basis, plunge pools are a very individual thing. They can be rectangular or round, elongated or square, more or less deep, stand-alone or incorporated in a larger wellness-area, among many more. We have collected some of the most beautiful and/or unique plunge pools ideas to spark your imagination, and hope that you’ll find yourself lounging in relaxing water after your workout or a long day at the office soon! 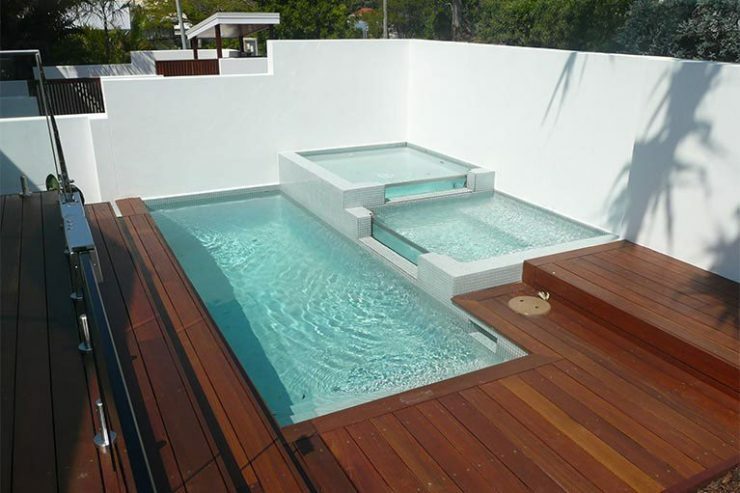 This example of a plunge pool is probably the coolest looking option you can think of. The glass sides make the plunge pool look like an optical illusion, and just draws the eye, even if there’s nobody in it. This example of plunge pool is an uncommonly deep example, obviously targeted more at submerging than wading, and is therefore a beautiful example for the versatility and unique nature of plunge pools. 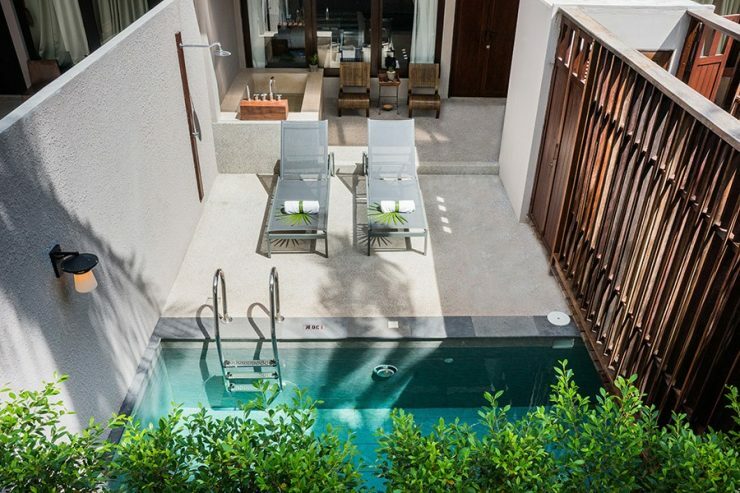 This beautiful small plunge pool is the perfect add-on to the private sun terrace. In size, this little pool is hardly longer than your average sun lounger, and is just perfect to quickly cool off after working on your tan. 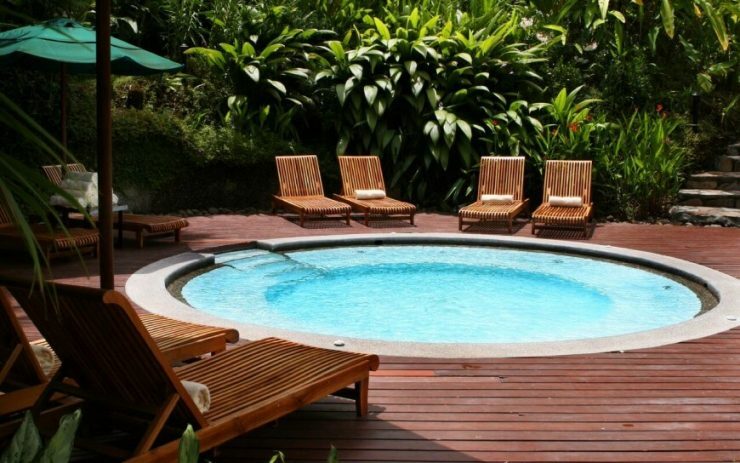 This circular plunge pool is a wonderful example for how these typically rather shallow pools can be used to fully submerge yourself without having to flop around like a fish. The stone wall surrounding this square plunge pool gives it a wonderfully natural look that helps to make it seem like a part of the garden rather than a man-made construction. As you can see by the low wall and few steps, this plunge pool is perfectly suited for wading, but easily deep enough to fully submerge, and might even allow for a few strokes if you have children who like to swim. 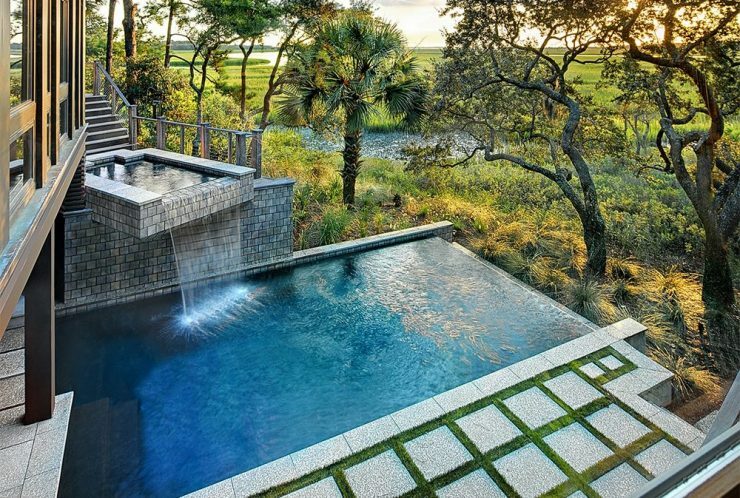 This three-tiered water oasis is the perfect example how a regular sized pool can be combined with a smaller plunge pool (and other spa features). In combination with the wooden floor boards and the glass-and-concrete walls of the individual pools, this private spa area is the embodiment of understated luxury and elegance. 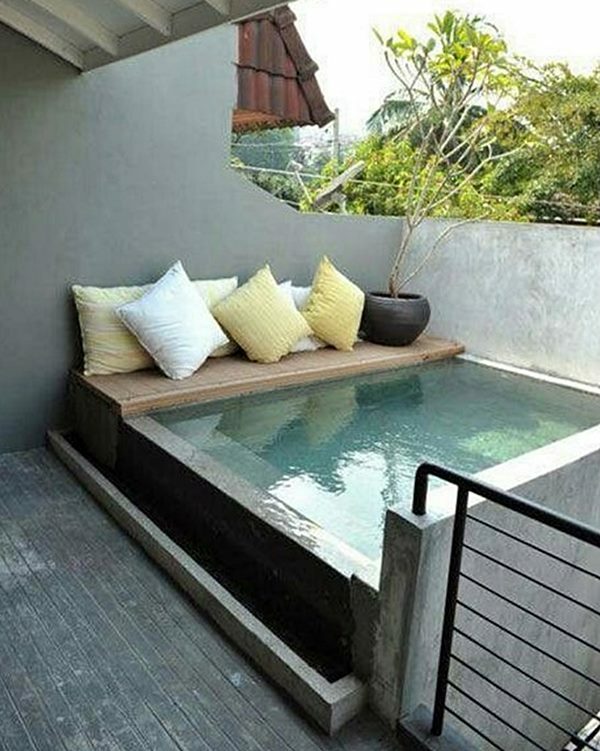 This plunge pool makes the utmost of the available space. The infinity wall opening the view to the landscape beyond creates an illusion of spaciousness, and the small pond feeding the waterfall echos the untamed nature of the landscape beyond. This plunge pool is an example for the ingenuity that is mixing luxury with nature to foster relaxation and invite the feeling of being on vacation to your home. 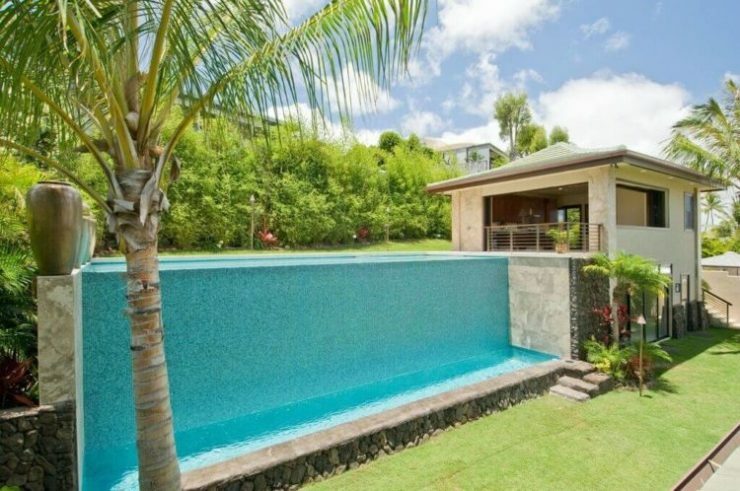 Have you ever dreamed of rolling out of bed and go for a quick, private dip in your secluded pool? Or spending a nice, intimate summer evening lounging in your pool before heading off to bed? All you need to make this dream come true is direct access to a (small) terrace off your bedroom and a plunge pool. 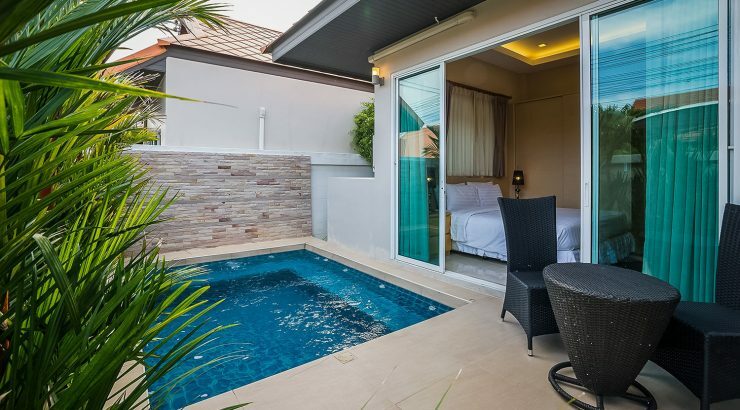 This square example takes up most of the available space, but really, the joy of having your private pool just off your bedroom more than makes up for lost lounging space! 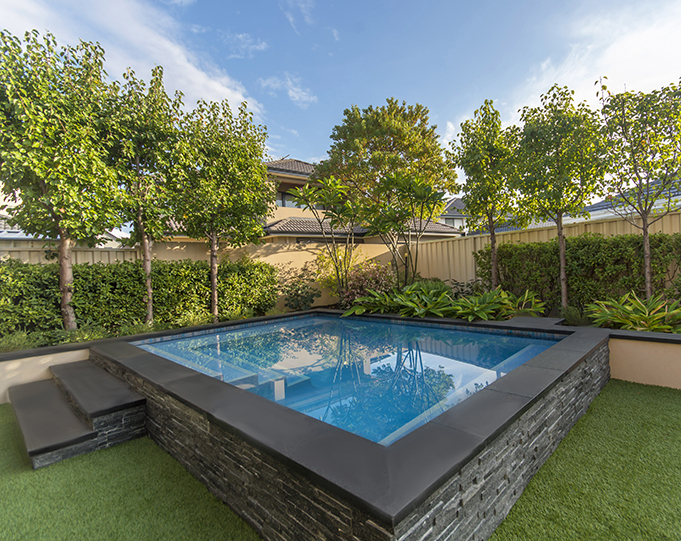 This lovely inground plunge pool is a wonderful example for one of the main reasons to settle for a plunge pool instead of a full-sized one: available space. 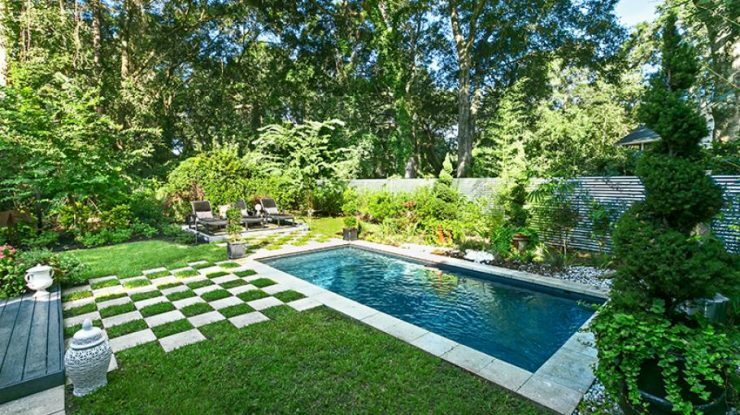 In this smallish backyard, a full-scaled pool would take up so much space that there would be hardly any garden left. 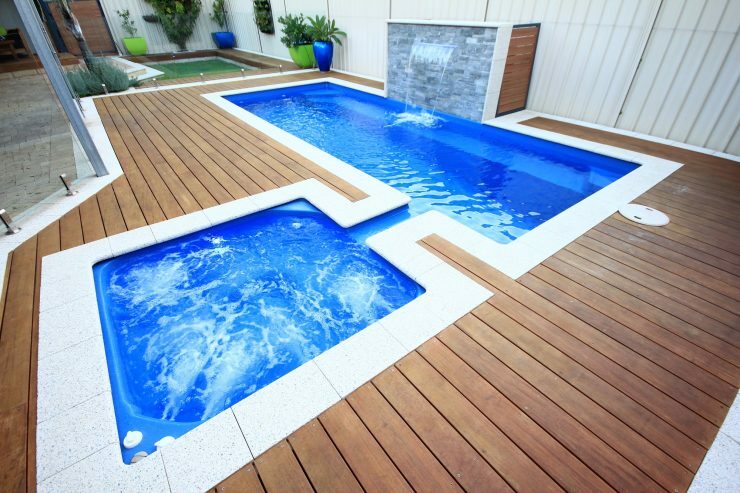 A plunge pool, particularly in an elongated shape, allows for all the joys of a regular pool except for swimming laps, without taking up too much of the available garden space. Interested in something a bit more unique than a regular plunge pool? Then using a concrete tank as basis for your new pool is just the way to go! 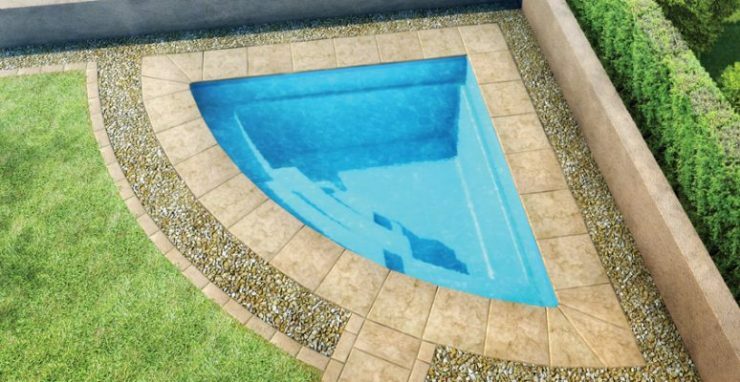 With its rough ‘this bit got left behind by the builders’-look this kind of plunge pool is just the perfect way to give an edgy look to your yard and/or spa design. You literally only have one corner of your garden left to use? No problem! A wedge-shaped plunge pool fits perfectly even into the last corner you have available without loosing on any of its fun. The rounded side is perfectly suited for supporting a sunken ledge for comfortable seating while still giving enough space to fully submerge in the nook-area. 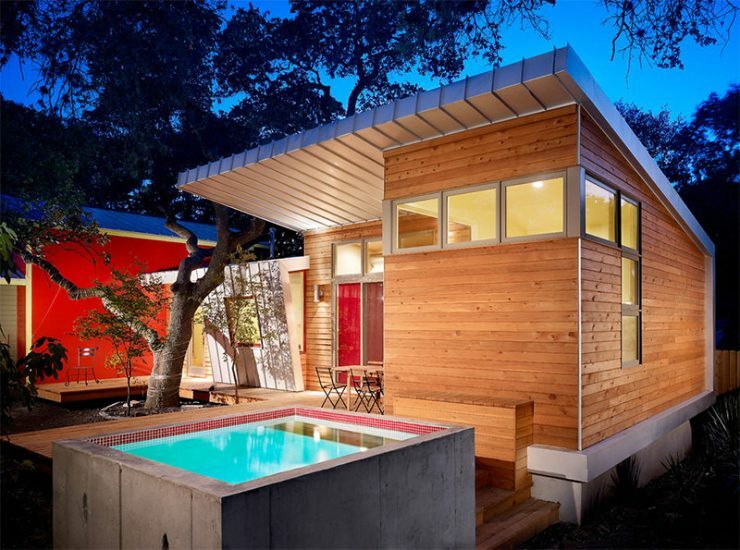 This combination of whirlpool and plunge pool makes your home into a true spa area. A regular sized pool would approximately cover the same square space as this combination does. By going for a fair-sized plunge pool instead you gain the joys of a whirlpool without loosing the swimming opportunity. 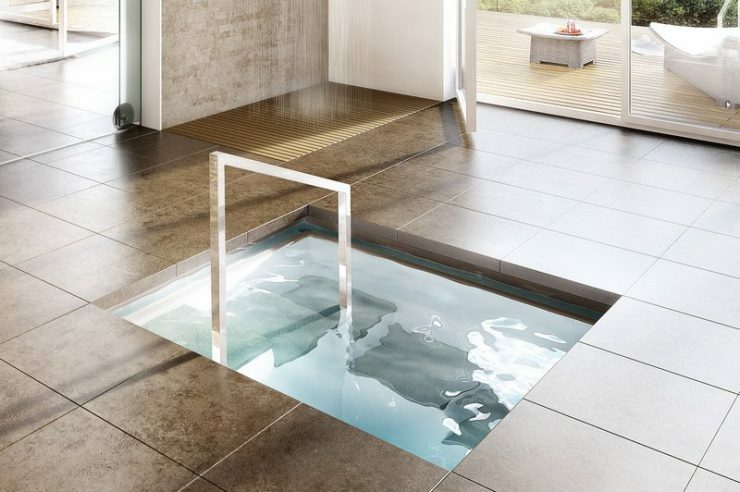 This indoor plunge pool shows how exceedingly tiny plunge pools can also be. This example is clearly targeted at speedily cooling your body off after going to the sauna or a hefty workout in order to speed up recovery, but it would work just as well outdoors if you’re looking for a space-saving way to simply dip into blessedly cool water during hot summer’s days. This plunge pool is exceptionally designed in that it is wholly lined with the same stone tiles that are used on the surrounding terrace, making it appear as if the whole patio has been made out of one piece. 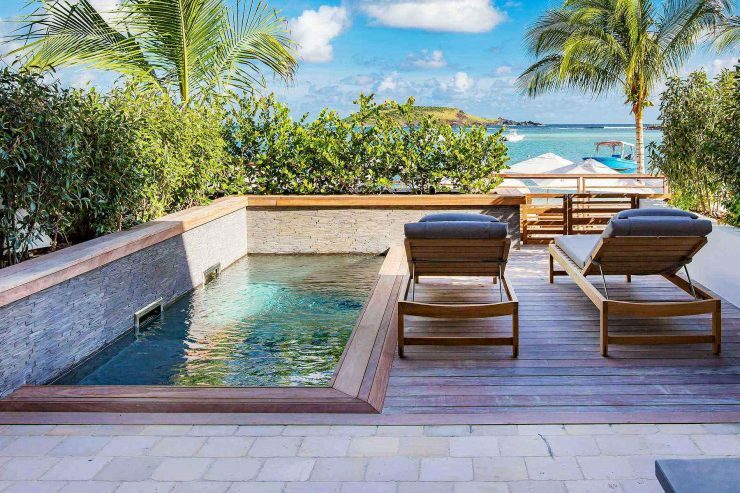 The incorporated slightly elevated sun lounger directly at the plunge pool’s side is another great idea that rounds out the whole design and sets this plunge pool apart from many more ‘traditional pool’-like examples. No traditional garden is no excuse! As you can see here, a plunge pool can even transform otherwise bleak concrete ‘gardens’ into a space for refreshing and relaxing. This rather tiny plunge pool fits well with the overall concrete look of the outdoor space, and the simple wooden bench makes for a lovely seating area that encourages long evenings spent chatting while cooling off ones feet in the water below. Living in a city oftentimes means hardly any greenery or real garden in your backyard. If you’re lucky, you have a small concrete space and a hedge. But really, that is enough to transform your otherwise dreary backyard into a veritable oasis. A small plunge pool tucked right along the edge of your property should allow for enough space to set up a sun lounger or two. Add a few potted plants, maybe a few fairy lights or candles, and you’ll feel as if you step out into your private holiday paradise. Plunge pools usually are picked because of their smaller size compared to full-sized pools, by people who don’t want or need a lot of space to actually swim. However, if you want to make up for what your property is lacking in garden space, but don’t want to compromise on swimming opportunities, a plunge pool might also be the right choice for you. A wrap-around solution that follows the line of your house or terrace is just perfect for anybody who doesn’t need a lot of width, but looks for enough length to properly swim. Additionally, a wrap around solution gives access to individual “private” pool-areas in front of each room without needing to actually invest in multiple plunge pools or spas. Just divide the wrap-around pool with little gangways or plants across the water, and you have multiple smaller pools for the price of one. Your family will love it! 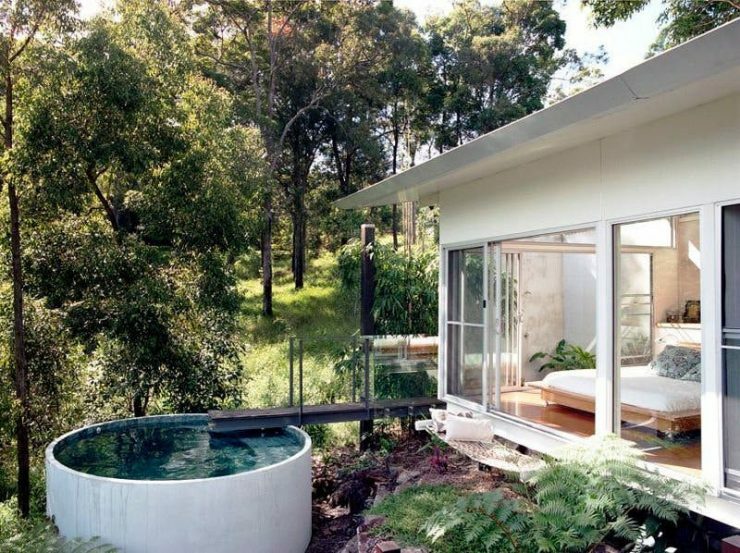 This example shows that you don’t necessarily need a backyard to have a plunge pool. A terrace area, or other means to be outdoors is more than enough to fulfil your dream of a pool. The easiest way to incorporate a plunge pool into your house is during the planning stages. However, if you buy an already existing home and want to add a small plunge pool without re-modelling either the house or the garden, using a concrete basin is a quick and easy way to add a pool to your home. 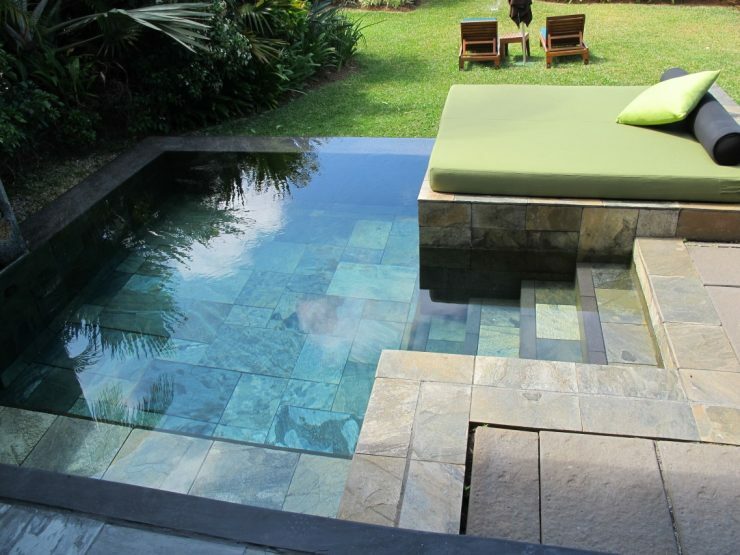 You fancy the look of a pond but would rather dip into the clean waters of a pool? 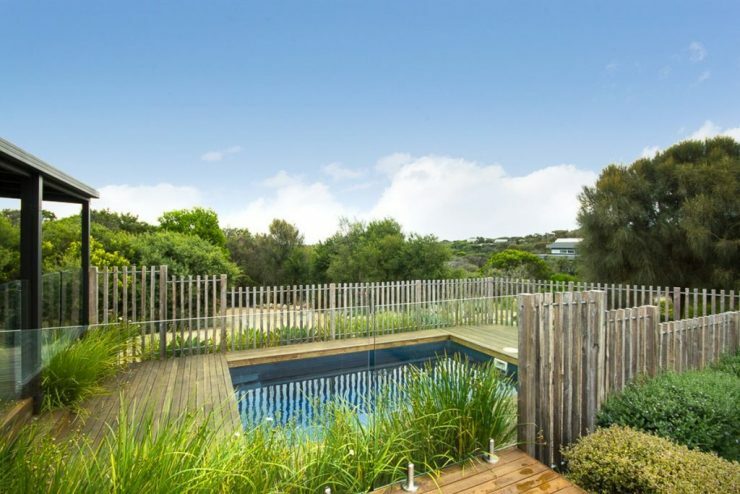 Surround your plunge pool with a wooden deck and fence the whole area in ferns and grasses to mimic a pond with a private bathing jetty surrounded by water plants and a natural shoreline. The best feature of a plunge pool? You don’t need a garden, at least not an earth-bound one! 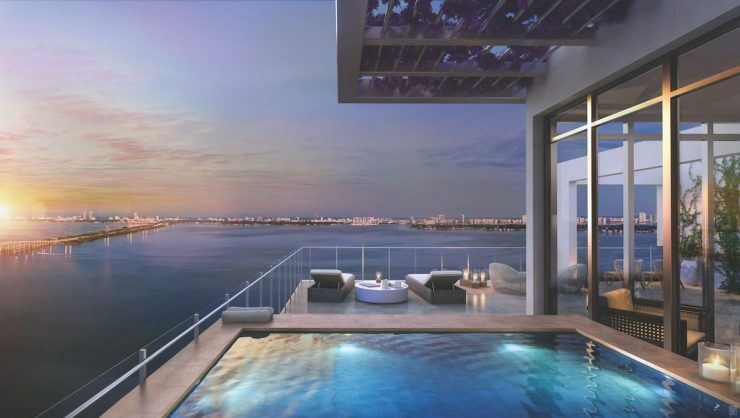 Due to their small sizes, plunge pools can actually be installed on rooftop terraces and/or (very sturdily built) balconies, as well as indoors. Smaller size and little depth translate into less weight, making them as likely to be found far above ground as whirlpools – and those can be found nearly everywhere, including inside flats and bedrooms, these days!